When it comes to the recent school shooting, there isn’t much I can say that will change the events that occurred, or make anyone feel better about it. No matter where you stand on the issue, we’re all mad. We’re all scared for ourselves, our friends, and our family. Some of us have spoken out, sharing our concerns about a national tragedy to make ourselves feel better— speaking out makes us feel like we’re doing something about it, but if all you’re doing is retweeting, are you really helping? The truth is, actions speak louder than thoughts and prayers. A Facebook status about praying for the victims isn’t going to do anything about the shootings we have in this country. Posting a tweet and then going on with your life as if nothing ever happened does not help anything. The way social media reacts to national tragedy is sad and disheartening. We’ve seen this with all of the “Pray for [insert recent horror here]” profile pictures, celebrities being obligated to post about their prayers (and being ostracized if they don’t), and retweets galore telling us to “pay attention”—but who’s actually paying attention? Are all of these people voting? Are they getting involved in their local communities and having conversations about the things that need to be changed? Are they researching their politicians’ views? Although some are, the majority are just posting online in order to comfort themselves about what’s going on. If you want to make a difference, the most important thing to do is vote. We will never change the minds of National Rifle Association members and gun owners, so the only way to make change happen is to elect officials who promise to take action on gun control—and ones who receive zero money from the NRA. A shooting happens, everyone prays, nothing gets done, everyone goes back to normal. And then another shooting happens. Rinse and repeat. We scream and shout about nothing getting done, but still nothing ever happens. Why? Because our politicians are receiving millions of dollars from the NRA. The money means more to them than the families being torn apart by shootings. Fourtune.com reports that in the presidential election alone, the NRA and other gun lobbyist groups spend $11,438,118 in support of Donald Trump, and $19,756,346 to oppose Hillary Clinton. And that’s only one election– there’s plenty more bribes-disguised-as-donations happening at more local levels. These politicians don’t want to lose that cash, so they protect the NRA and gun lobbyists. As young people, we have the power to change this. We’re already seeing protests and strikes across the nation, most notably in a recent town hall in which Florida students came face-to-face with Marco Rubio, putting him on blast for accepting donations from the NRA. 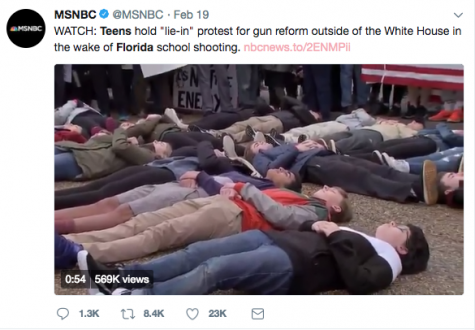 Others are taking their protest to the White House, holding a “lie-in” to speak out against the current gun laws that lead to mass shootings. Some republicans have spoken out against them, saying that these teens are just being used by the left in order to push their ideals. Young people are speaking out, taking action, and getting involved all on their own. This is just as much our country as it is the older generations’, and we need to take matters into our own hands– because we can. We have to power to organize, protest, vote, and make change happen. Stay informed. Read the news and be aware of biases in the writing. Keep up with what’s going on and what’s important to you. Be involved in politics. If you’re old enough to vote, research your choices and make sure you vote for the candidates that care about the issues closest to you. Call, fax, and send letters to your senators and representatives and let them know that you care about what’s going on. If you have a bit of extra cash, donate to an organization that directly benefits a cause and is working to create change. Any amount counts, and skipping a night out isn’t much of a sacrifice when you think about it. If there’s a march, rally, town hall meeting, or any kind of event happening in your area, go there and speak your mind. Be part of a group of voices taking a stand. Encourage your friends and family to do the same. Talk about the issues, and get these tough conversations started. Listen and try to understand the people on the opposing side, and don’t ridicule them for having certain opinions. Share your views in a positive way, and don’t spread negativity or start fights. Even doing one or two of these things can have an effect on the world around you. And the more people that get involved, the more we can change this country to be a better place for all of us to live and thrive. I’m not saying you shouldn’t pray for the victims of tragedy, but don’t get caught in the social media sympathy trap. If you care, do something about it. If we all come together, we can change the world for the better.